Comes in full sealed retail packaging containing 20 x strips and 1 x light. Results last up to 36 months. Whitening results last up to 36 months! Take your smile to a brilliant new level with the most advanced way to whiten teeth yet – Crest 3D White Whitestrips with Light. The whitening power of the enamel-safe Whitestrips gets a powerful boost thanks to the handheld light that targets yellow stains, brightening teeth with our best and fastest whitening technology – and at a fraction of the cost of professional treatments. Crest 3D White Whitestrips use the same whitening ingredient as your dentist, and when used together with the water-resistant, specially engineered blue light, you’ll see faster, more dramatic results than with Whitestrips alone. For added convenience, Advanced Seal technology holds the whitening strips securely in place, and after completing the full teeth whitening kit, the results you’ll see last up to 36 months. Achieve dramatic whitening results with Whitestrips and the innovative Crest-exclusive blue light device. The targeted light penetrates into the enamel to target yellow stains, delivering faster and more effective results than with whitening strips alone. Get professional-level results with ease. The water-resistant, handheld device is lightweight and easy to use with an automatic shut-off to signal when your treatment is complete. Designed to whiten your full smile, the handheld light is so effective, it’s only needed for approximately 10 minutes following each whitening treatment. After you’ve completed the full whitening kit, the results you’ll see will last up to 36 months. Q: Why should I use Crest 3D White Whitestrips with Light? A: Crest 3D White Whitestrips with Light whiten with our best and fastest whitening technology – and at a fraction of the cost of professional treatments. The active ingredient in Crest Whitestrips is the same as what you’ll find at your dentist’s office, and when paired with the innovative blue light device, removes set-in stains below the enamel surface faster and with brighter, more dramatic results than with Whitestrips alone. Plus, Crest Whitestrips teeth whitening kit guarantees a whiter smile or your money back. See package for details. A: No. When used as directed, it’s a safe and effective addition to your beauty routine. Crest Whitestrips contain the same enamel-safe teeth whitening ingredient as dentists use to whiten teeth, so you can be confident that they’re safe. Q: How do Crest 3D White Whitestrips with Light work? A: Crest 3D White Whitestrips are thin, flexible teeth whitening strips that are coated with the same effective teeth whitening gel that’s used in dentists’ offices. The strips are designed to conform to the shape of your teeth, and use Advanced Seal technology to keep the whitening gel securely in place. After 60 minutes of use, the handheld light device is applied, allowing the specially engineered blue light to penetrate the enamel surface. This weakens yellow stains producing faster, whiter results. Q: How long does the light battery last? A: The handheld light is conveniently designed to work with the 10-treatment Crest Whitestrips teeth whitening kit. At the end of each treatment, it automatically shuts off to signal the whitening is complete. 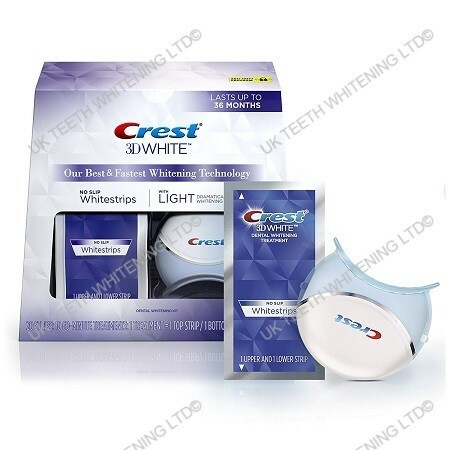 The Crest device is designed to operate for the number of Whitestrips in the package. Discard device after last Whitestrip is used.